This NBA Superstar is a family man, MVP, and a killer in the 3-point line, and tagged as one of the best in Pro Basketball. 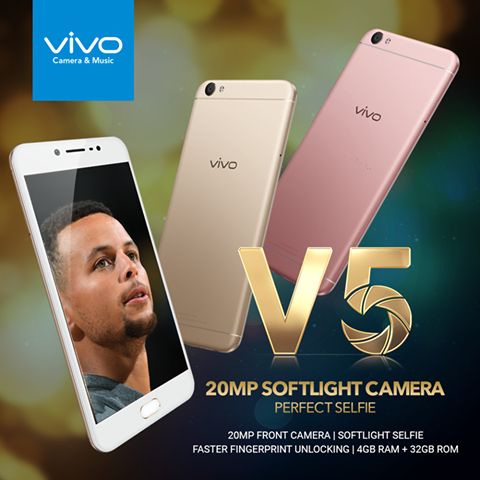 Yes, Vivo PH announces Stephen Curry of the Golden State Warriors as its Brand Ambassador inline with its release of the Perfect Selfie smartphone Vivo V5. This is an amazing milestone for Vivo as it lands its first endorsement with a big name from world famous name. Just like Steph Curry, Vivo keeps on breaking records and now know as the Top 5 smartphone across the Globe. During the Vivo Grand Launch, a video was played showing Stephen Curry praise towards Vivo and how excited he is in joining Vivo's growing family. We can't help but to wonder to the words of Steph Curry as he may hinting more releases of Vivo o maybe a Stephen Curry Vivo smartphone in the works. How cool it is if Vivo launches Steph Curry Limited Edition Smartphone. The Vivo V5 is now available for preorder at PHP 12,990 from November 23, onwards. Exclusive with the Vivo V5 Pre-order are freebies such as Vivo speakers, Vivo selfie stick and a Vivo-branded phone stent.